There has been a lot of not-so-happy talk over the last week about Verizon and the elimination of 1-year contracts from new customers or from those that are renewing, but after glancing around their site for a few minutes today, things may not be so bad after all. Check out the screenshot above that was taken within the last few minutes from Big Red’s site and tell me you aren’t excited about those full retail prices. A DROIDX for $399? 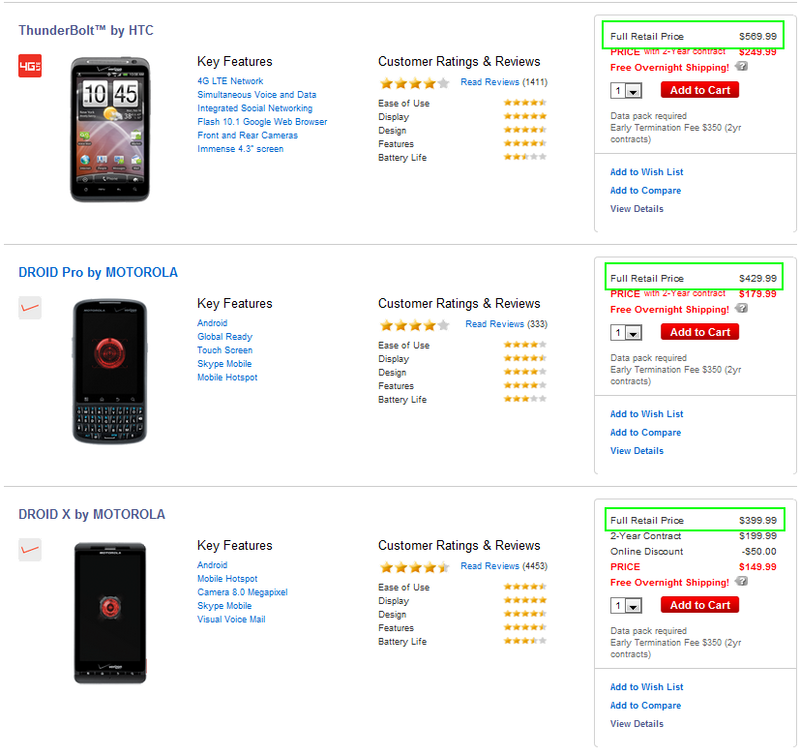 DROID Pro for $429? How about the brand new HTC Thunderbolt for $569? While we’re sad to see 1-year contracts go, this appears to be a great sign for those of us that refuse to sign contracts at all. We’ll be digging around our VZW contacts for more info. …there is no connection between the 1-year contract announcement and adjustments in our smartphone pricing. We adjust our pricing from time to time to address current market dynamics and to stay competitive. The good news is the Droid franchise is extremely popular so lower prices mean more customers can experience one of the fastest growing operating systems on the nation’s largest and most reliable network. Let’s just hope these prices stick for the foreseeable future because I’m a fan.